It always makes me a little sad to take down the decorations and to put the tree away. 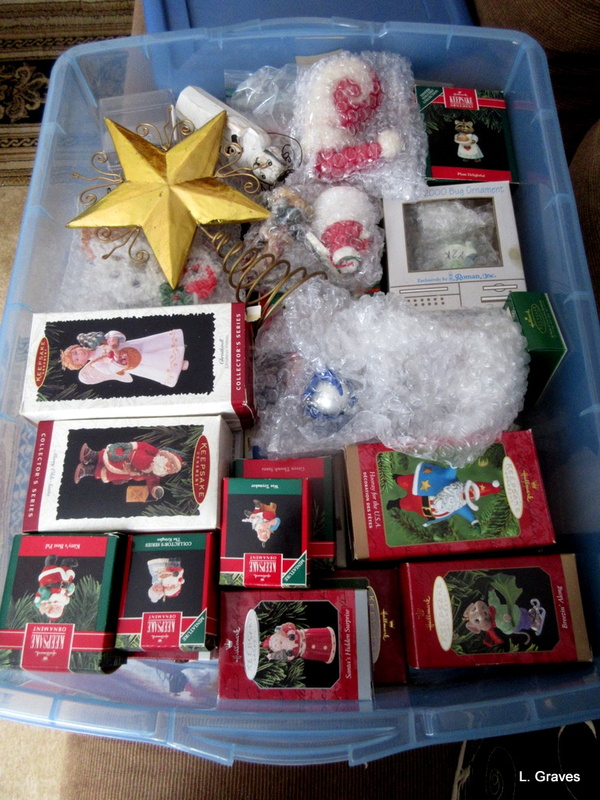 I miss the the ornaments—some fanciful, some homespun, some lovely—and the soft glow of the lights. Here they are, all packed away. Farewell, my sweets, until next December. But I really didn’t have time to brood because after the decorations were put away, it was on to the next project—apple crisp, which we brought to our friends Judy and Paul. We took it hot out of the oven, hence the towel and pan, and at Judy and Paul’s house, the crisp was still warm enough to melt ice cream when it was served. 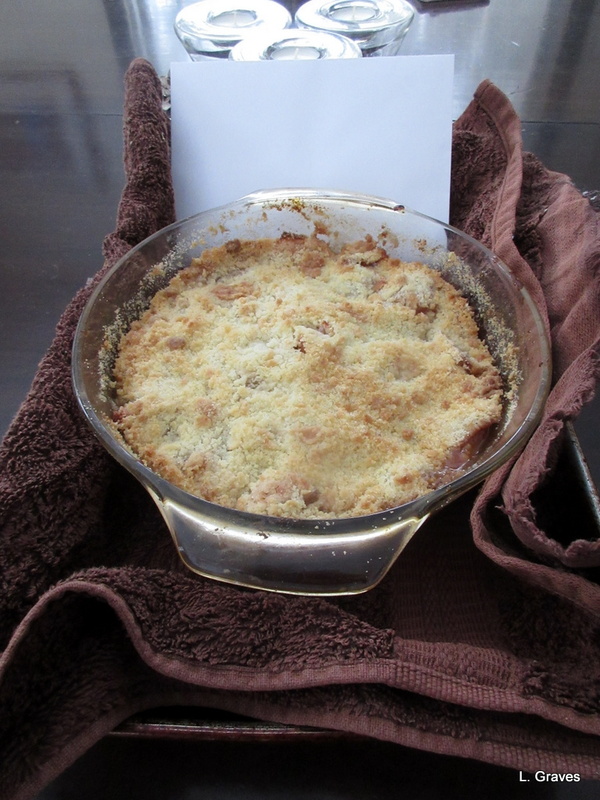 Somehow, apple crisp is such a cozy, satisfying dessert in the winter. Best of all, I am able to get local apples at a nearby orchard well into winter, and I plan on making quite a few apple crisps for friends between now and spring. At Judy and Paul’s, we talked of many things—politics, American history, and the moral failings of our founding fathers, who pieced together a country but blighted it with slavery. Unfortunately, the ugly repercussions are still being felt today, over 200 years later. Paul noted that our founding fathers—John Adams, Thomas Jefferson, Benjamin Franklin—did the best that they could. But did they? What would have happened if slavery had not been permitted? No country? Quite likely, but things fell apart less than a hundred years later, with the Civil War. Even afterwards, so many people continued to suffer because of the color of their skin. And still do. Heavy topics for a January day. Good thing we had apple crisp, ice cream, and tea to lighten the mood. When we came home from Judy and Paul’s, Clif made some of his delectable homemade French Fries, and we had them with faux chicken nuggets, which are tastier than you might think. Alas, no pictures. I’ll do better next time. 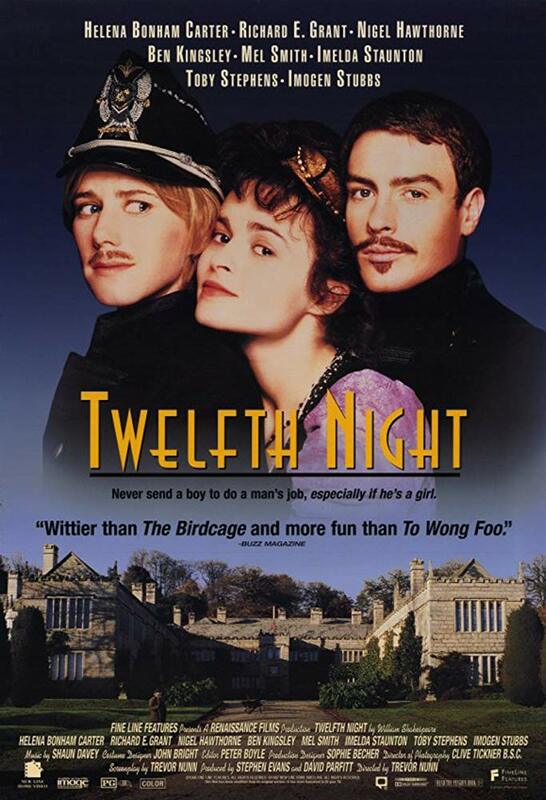 Then we settled down to watch Trevor Nunn’s delightful production of Twelfth Night, filmed in Cornwall and starring, among others, Ben Kingsley and Helena Bonham Carter. We own the DVD and watch it yearly. I think you can guess on which night. 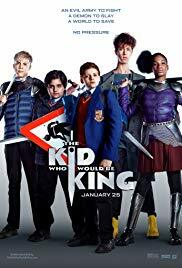 A bit of trivia: In Nunn’s Twelfth Night, Kingsley plays the jester, Feste, and I based my own Feste, in Maya and the Book of Everything, on Kingsley’s performance. Might as well borrow from the best. 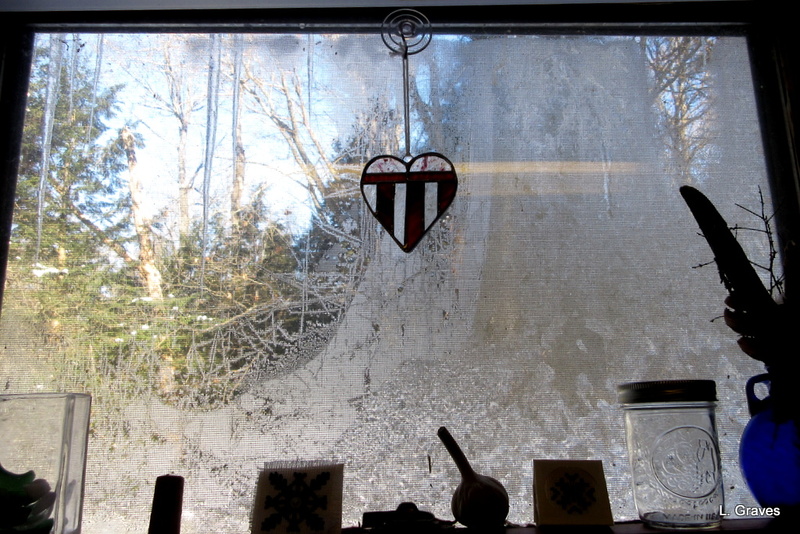 There are two things Mainers hate to see in the winter—the first is rain, and the second is freezing rain. 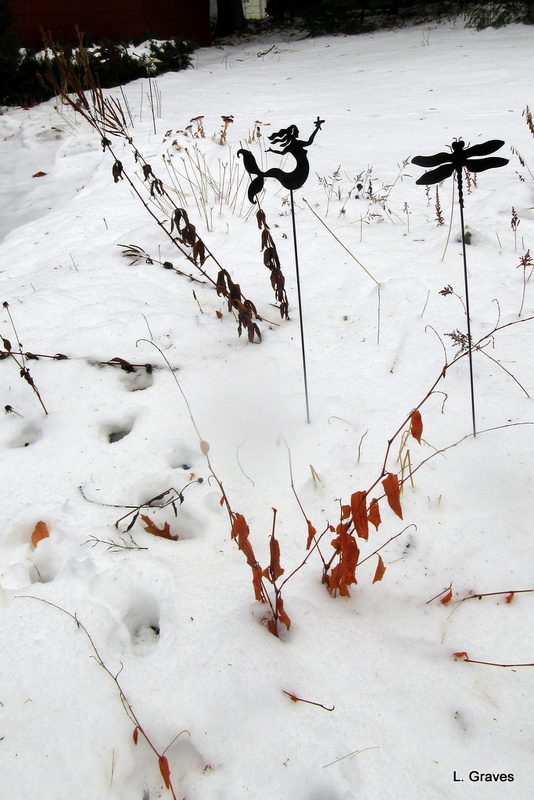 The two often come hand in hand, and at best, they make the landscape a soggy, unappealing mess. At worst, the roads and walkways become slippery, treacherous even. And the power goes out. 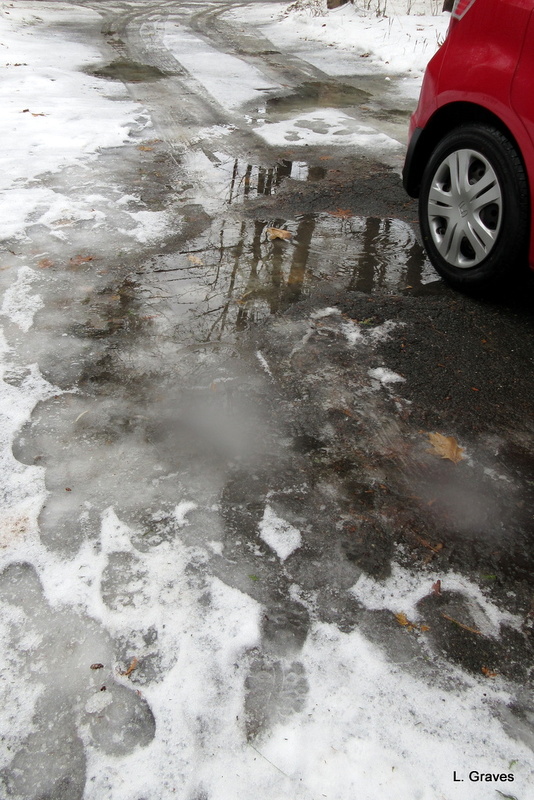 Yesterday, we got both, and here is what the driveway looked like. What. A. Mess. The front yard looked a little better. 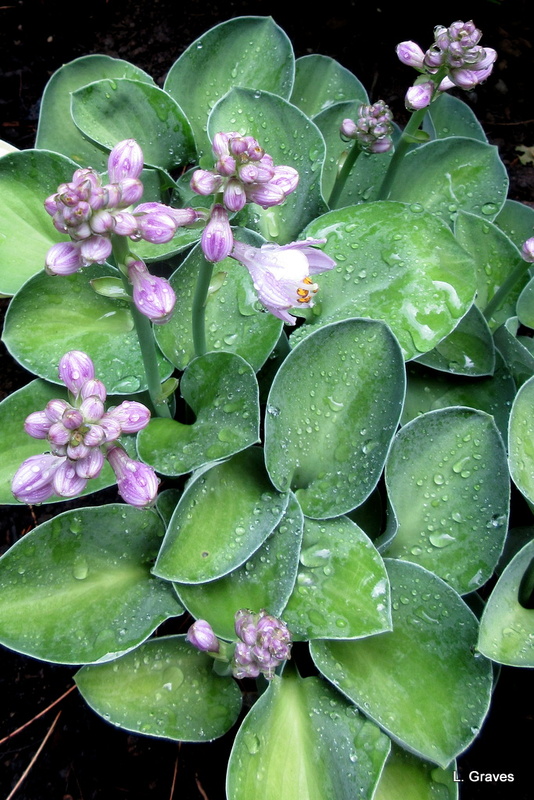 The uncut perennials bring some visual interest to the wet landscape. Still, it’s hardly a sparkling winter wonderland. I am happy to report that we did not lose our power, and fortunately, the roads were not slippery as we had to bring our daughter Dee to Portland where she could take the bus back to New York City. While we were sorry to see her leave and would have loved to have had another day with her, it was good Dee could leave when planned. She didn’t have to forfeit her bus ticket, and she didn’t have to take another vacation day. While Dee was here, we went to the cinema to watch two movies that perfectly illustrate our eclectic tastes. Both films were worth seeing. The first was Fantastic Beasts: The Crimes of Grindelwald. Critics have not liked this movie very much, but with all due respect, I think the critics are wrong in this case. For those who like fantasy, Fantastic Beasts is a terrific movie with good acting, a fine script, wonderful cinematography, and a big plot about the supposed superiority of one group over another mixed in with the lust for power. The second movie we saw was Widows, a dark heist movie starring the fabulous Viola Davis, among other good actors. Widows is not the fun romp that the Ocean’s movies were, but it sure is gripping, and the film leaves the viewer with much to think about. Again, the notion of power is explored, this time through the lenses of money, brutality, and politics. Also, there is a genuinely surprising plot twist that none of us saw coming. Now that Dee is gone, we are settling back into our routine, which will be busy, busy, busy with a new book coming out soon. Very soon. To add to the fun, another snow storm is coming. 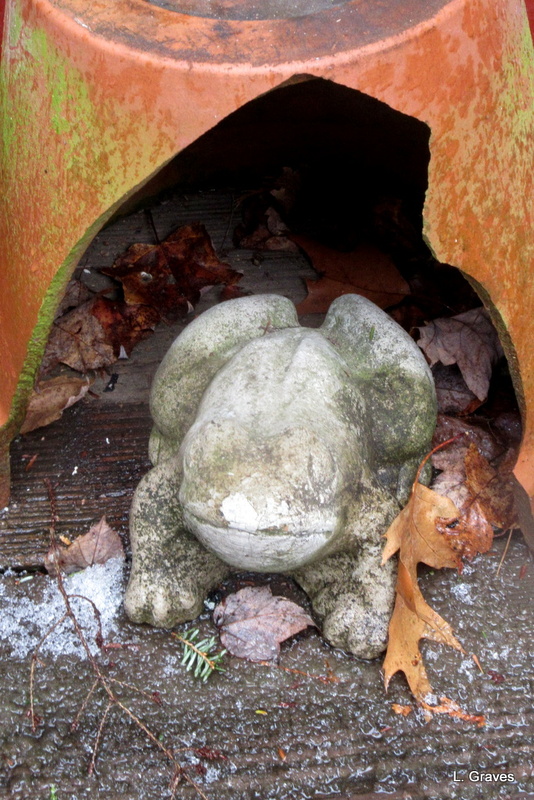 Winter is definitely here, despite what the calendar might say, and I’m thinking it is time to bring the last of the frogs in. 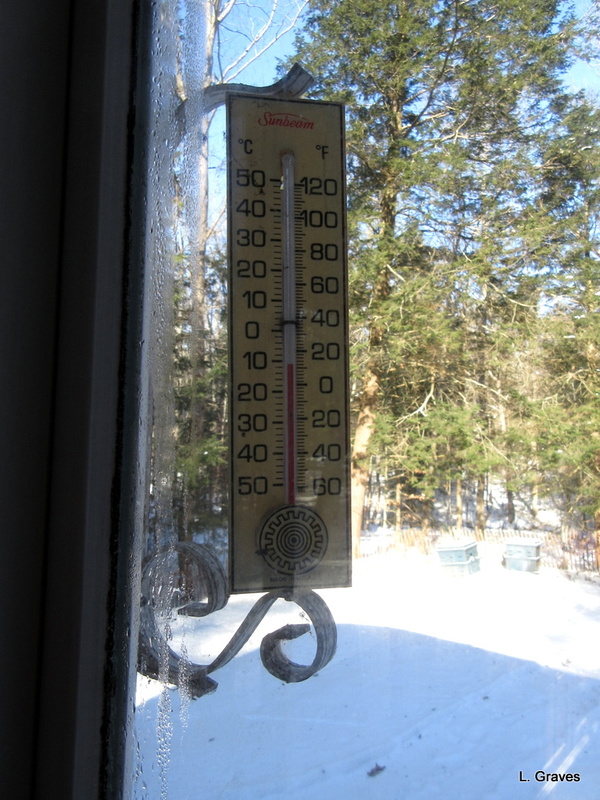 Yesterday morning this was the temperature, and a brisk wind made the air feel even colder. 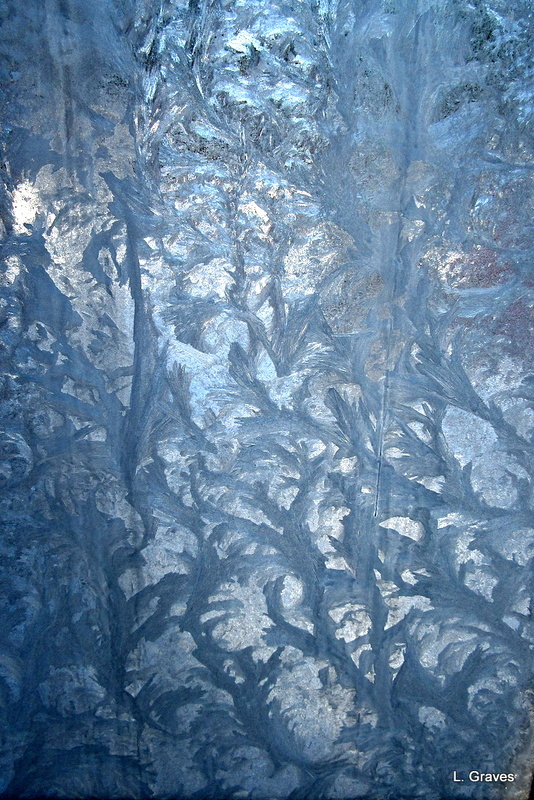 and other windows were frosted, too. No matter. Clif built a fire in the wood furnace in our cellar, and the house was cozy and warm. This year we had a quiet Thanksgiving, with our daughter Dee being our sole guest. Although Clif and I missed those who couldn’t come, we had an absolutely delightful time. Being movie hounds, we watched two movies. The first was the excellent The Ballad of Buster Scruggs, a dark, haunting Western presented in six episodes by the Coen brothers. The Ballad is available on Netflix. The second movie was the not-so-excellent The Square, which we thought would be a story about modern art and its uses (and abuses) but instead mostly turned out to be the tale of a hapless, bumbling museum director who seemed to be in a permanent state of arrested development. Ah, well! 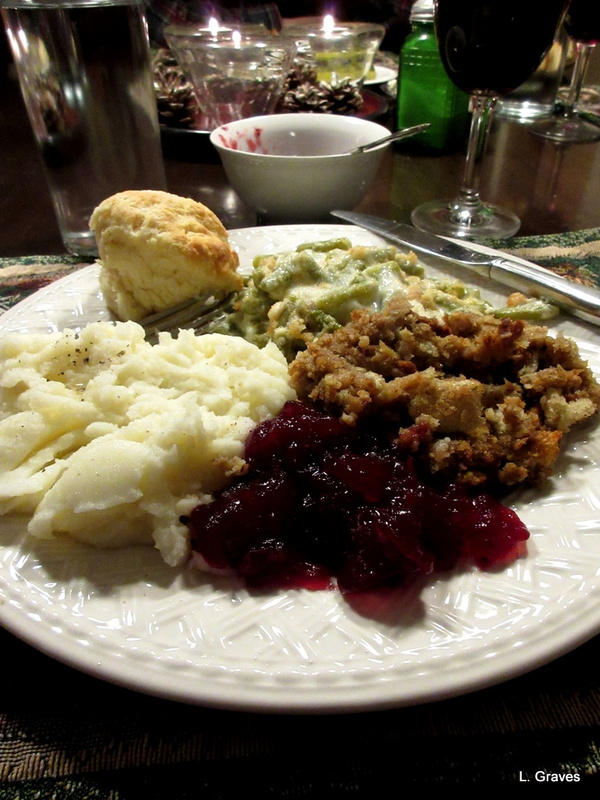 This year we had a vegetarian Thanksgiving dinner, and it was very good indeed. Clif and I have been going down the vegetarian path for years and are now mostly there. Dee has been a vegetarian since her college days. So we dispensed with the turkey and made the sides the main meal. For dessert was homemade chocolate cream pie, but I forget to take a picture of it. In the upper left hand corner of the above photo is what looks like a golden roll. However, American readers will recognize this roll for what it is—a biscuit. 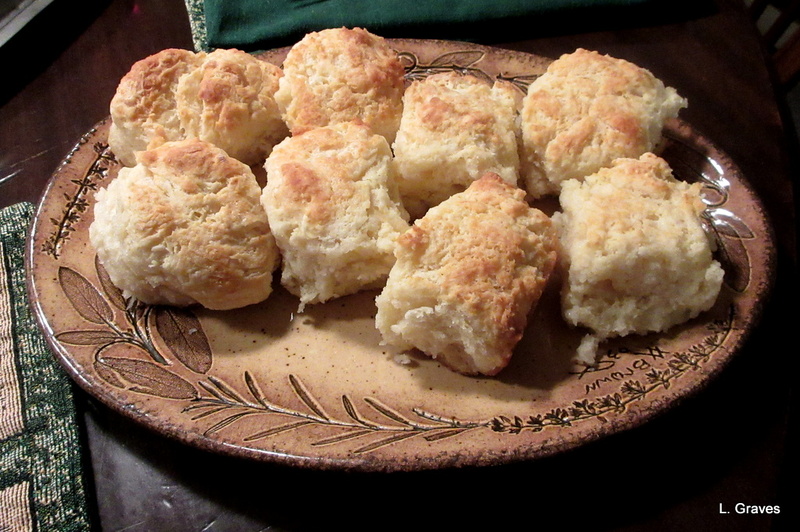 Here is a closer look at the biscuits, arrayed in glory on a platter. American biscuits are something like a scone, but they are not at all sweet and make a fine accompaniment to almost any meal, especially stews and soups. 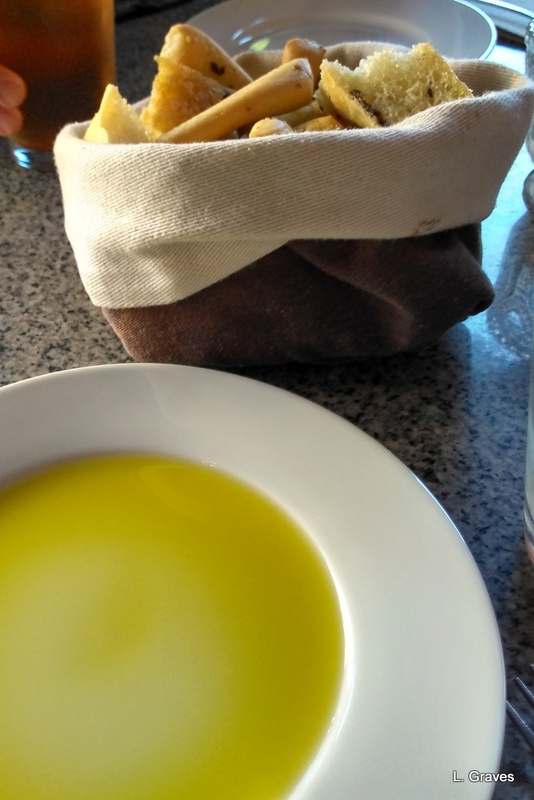 Biscuits are also good for breakfast, and that’s exactly what we had this morning, along with scrambled eggs made from the beauties our neighbor brought us. Tonight, there will be leftovers and pies. This has been a rainy, humid week. While the rain has been much needed, a few dry days would be nice. The house smells like mildew, and I even had to resort to using the clothes dryer. I know from sad experience what clothes smell like when racks are used for wet laundry during rainy, humid weather. Not good! On the other hand, it has been a good week for going to the movies and to the Colby Museum of Art. At Railroad Square, we saw two movies: Sorry to Bother You, Boots Riley’s wild, surreal, pointed look at racism and economic injustice in the United States; and Leave No Trace, a sad, beautiful story about an emotionally-wounded veteran and his daughter. If you like character-driven movies, Leave No Trace is a must-see film. In fact, both movies are very much worth seeing. For a small liberal arts college (1,800 students), Colby has an incredible art museum. It is free and open to the public six days a week. Because we live so close—about thirty-five minutes away—we have the luxury of focusing deeply on one exhibit at a time, which is my favorite way to visit an art museum. 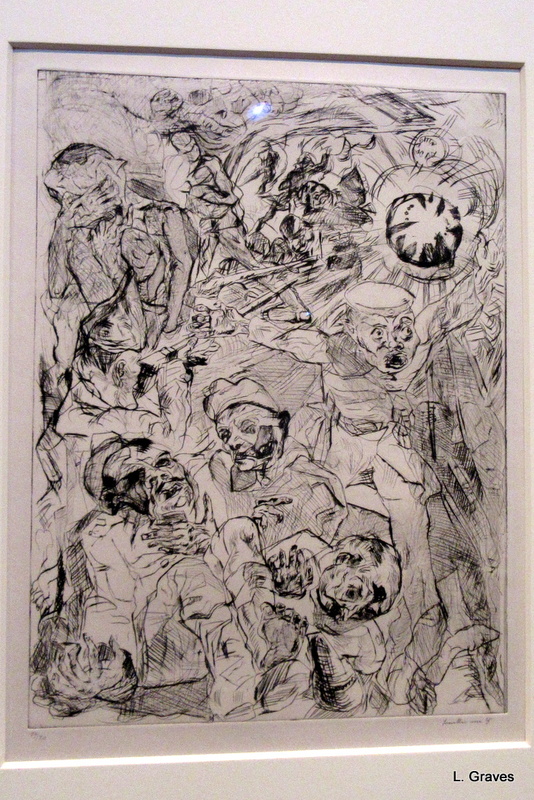 For this week’s visit, we focused on Self and Society, a collection of German Expressionist Prints. 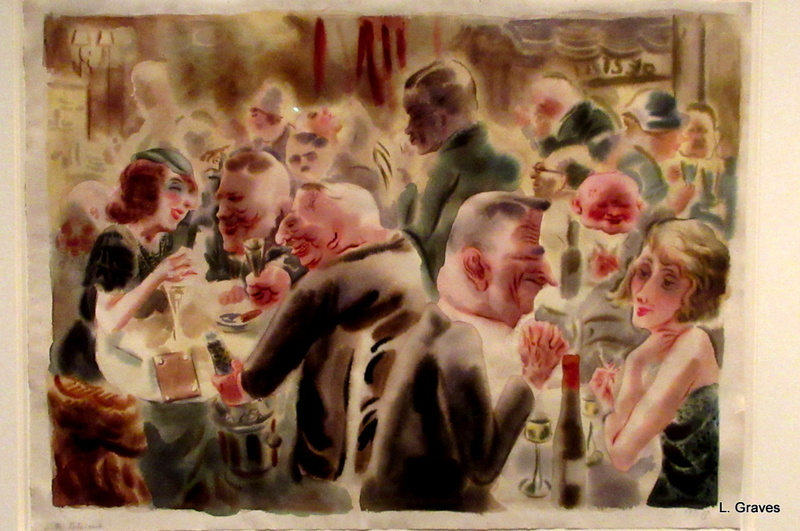 On its website, MoMA notes that German Expressionism was a “major modernist movement that developed in Germany and Austria during the early decades of the 20th century.” The painters and printmakers—George Grosz and Max Beckmann, to name two—were more interested in portraying emotions rather than the actual physical world. And the emotions they portrayed were usually dark and grim. Why wouldn’t they be? Many of the artists had fought in World War I and had witnessed firsthand the ugliness and brutality of that war. Not to put too fine a point on it, but the post-war period was not exactly smooth and tranquil either. Then we all know what came next. It seems to me that these Expressionist artists, who would be persecuted during the Nazi regime, had their fingers on the pulse of society. Their art will never go on the cover of chocolate boxes, but art is not obliged to be beautiful. To be sure, beauty is a part of life, and I appreciate beautiful art as much as the next person. But ugliness is also a part of life, and there are times when that reality is so great that artists have no choice but to face it and portray it. Here are a couple of photos I took of prints from Self and Society. 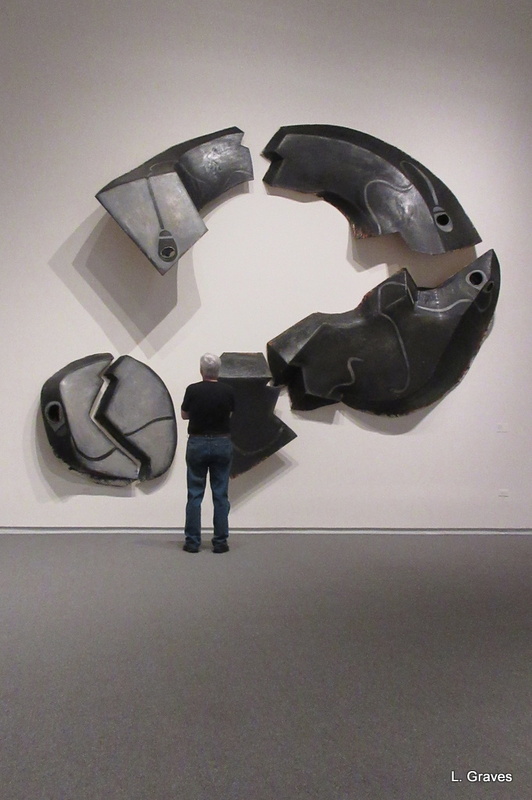 In the gallery below Self and Society, we came across this—Cracked Question by Elizabeth Murray, who was not a German Expressionist. But somehow, after seeing the horrors portrayed in Self and Society, Cracked Question seemed absolutely appropriate. The Maine International Film Festival (MIFF) is over, and yesterday, we dropped off Dee at the bus station so that she could return to New York City. Afterwards, we returned to Winthrop, whereupon we collapsed on the couch and took a long nap. Why we should get so tired after a week of having fun is beyond me. Old age? No stamina? At any rate, we were wiped out. But what a great week we had! 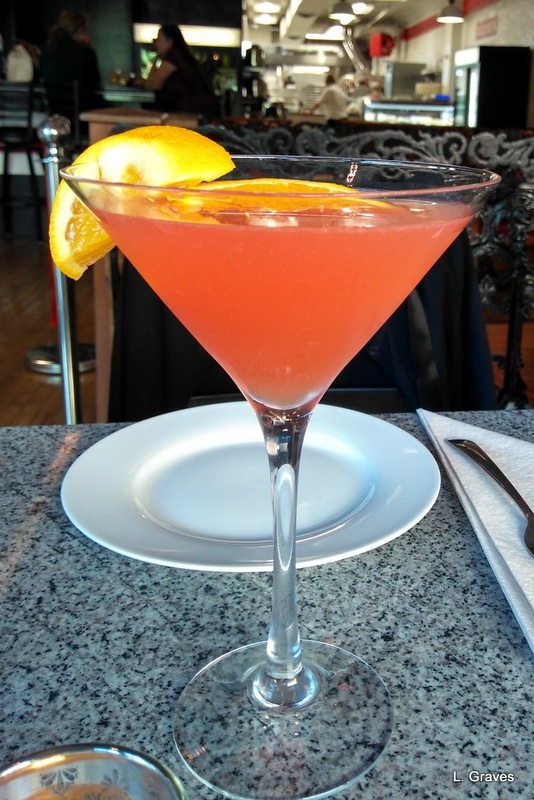 As the title of this post indicates, we saw ten movies in five days. 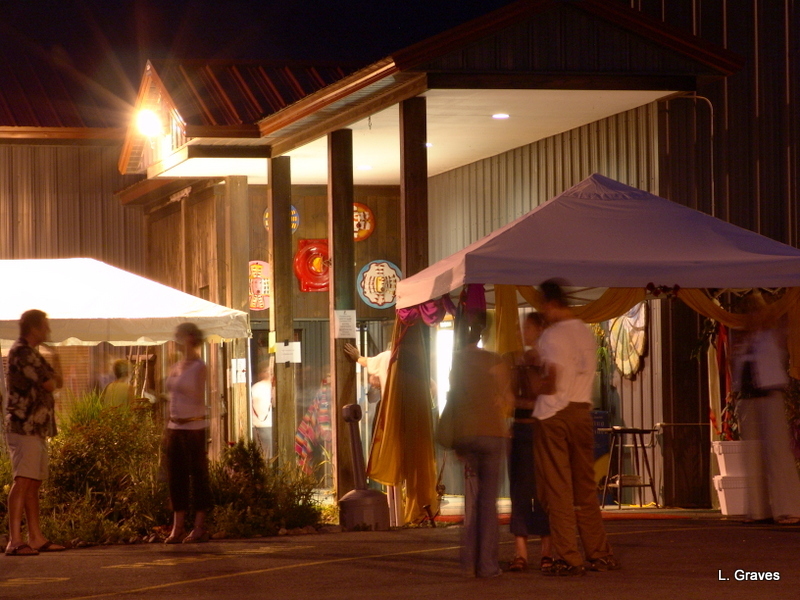 Waterville, Maine, is very lucky to have this film festival to bring a cultural spark to the area. It is also a boost to local businesses. Central Maine is not a destination for tourists, and while we have a slight influx of summer people who come to this region’s lakes, we do not have the great number of visitors that coastal communities have. During MIFF, the owner of one small cafe noted that they had made an extra several hundred dollars each day because of MIFF. For a small business, that is a big help. And speaking of small…one of the things I especially like about MIFF is having the chance to watch really small movies that I probably wouldn’t see anywhere else, not even at Railroad Square. We saw two such movies last week: The first was Waiting for Barcelona, Finnish filmmaker Juho-Pekka Tanskanena’s beautifully-shot documentary about immigrants. The second was Rungano Nyoni’s I Am Not a Witch, in which a little girl is accused of being a witch and is sent to a witch camp. Set in Zambia, I Am Not a Witch is a haunting fable suffused with magical realism. 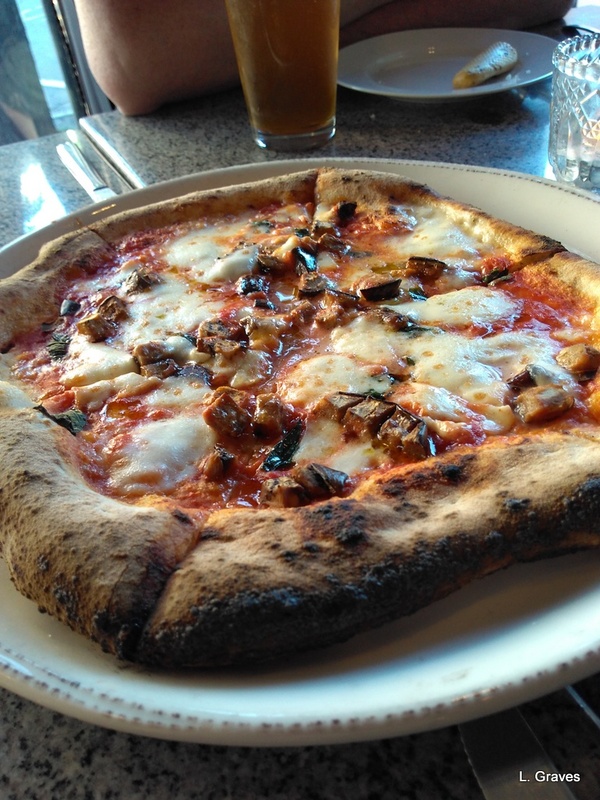 Between movies, we, of course, had to eat, and in downtown Waterville, we discovered Itali-ah Restaurant and Market. it was love at first bite. So good, so good! Itali-ah even has gelato, one of my passions, and we stopped in twice for a cool, creamy treat on a hot summer’s day. Now that MIFF is over, and we aren’t seeing two movies a day, you might think we are at loose ends. But fear not. Two new movies have arrived at Railroad Square. They are Leave no Trace and Sorry to Bother You. Always something happening in Central Maine. And in between, we even manage to get a few things done. Mid-July in central Maine. For the past week, the weather has been everything it ought to be. (Well, almost everything. We sure could use some rain.) The daytime temps are about 80°F, perfect summer weather. At night, it dips to 60°F, so cool that we don’t need fans, and blankets feel very good. 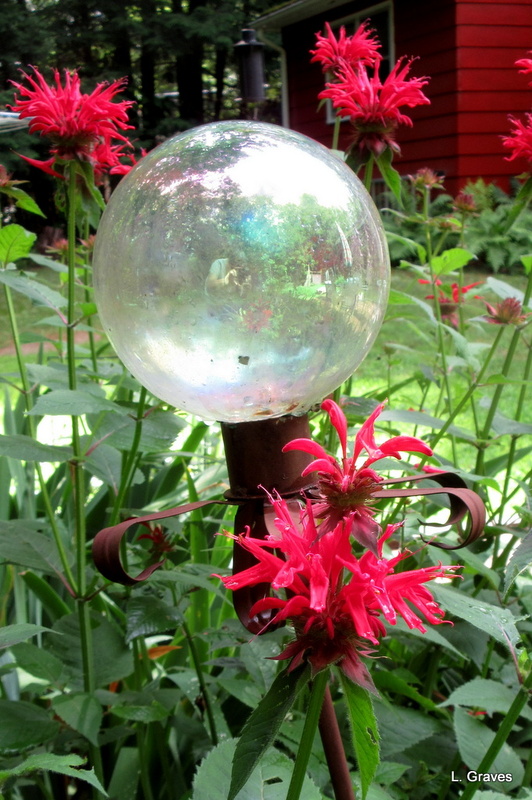 My gardens, known more for their cool green rather than for their profusion of color, are dotted here and there with flowers that tolerate some shade. 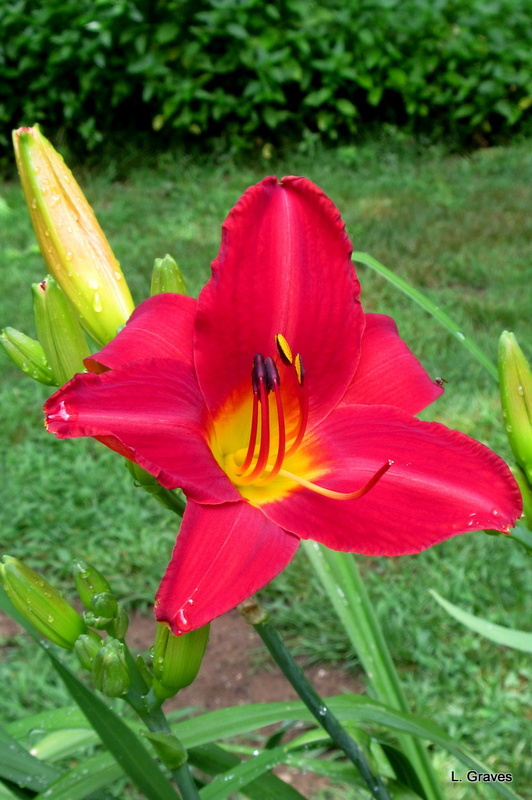 My favorite daylily is in bloom. Alas, I don’t know its name. One of my favorite small hostas—Blue Mouse Ears—is in bloom. 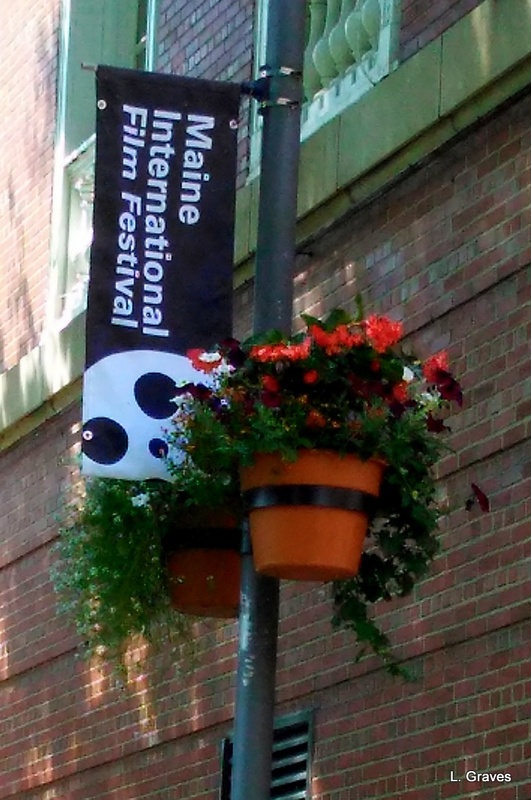 But along with flowers and sun, something else comes to central Maine in mid-July—movies, and lots of them, at the Maine International Film Festival in Waterville (MIFF). 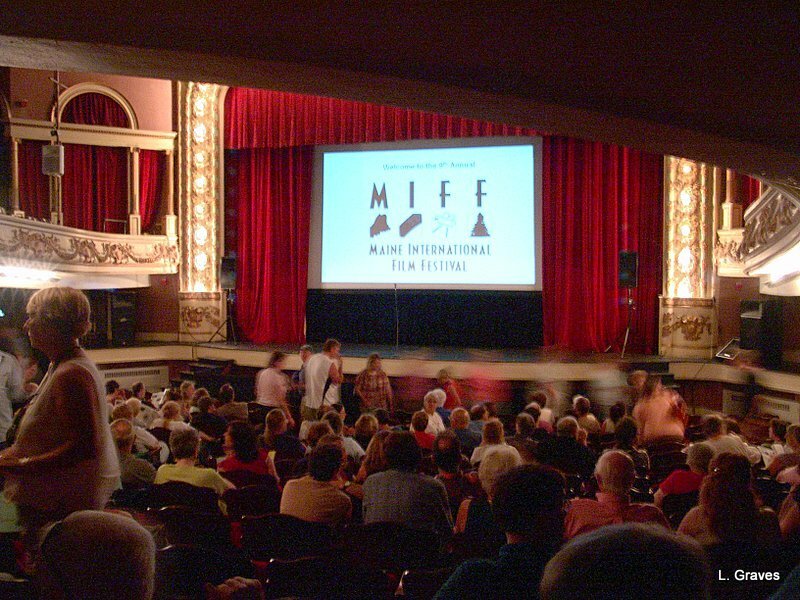 MIFF is a big event for Waterville and central Maine. Every year we look forward to it and see movies we never would see anywhere else, even at Railroad Square, our favorite art cinema. Our daughter Dee, a keen moviegoer, always comes to Maine for the festival. She will be arriving tomorrow and will be staying until Sunday, July 22. As is the case when any guest comes, there has been a flurry of cooking, cleaning, and grocery shopping. I’ve made and frozen chickpea patties for a quick lunch or supper. This afternoon, I made a batch of curried lentils. Tomorrow, chocolate chip cookies. Then it’s off to the movies. The first one we’ll be seeing is called Fake Tattoos, a movie from Quebec, which has a vibrant film industry. I’m not sure how much I’ll be posting next week, but I might slip in a few pictures of this or that and some words to go with them. For nearby friends, maybe I’ll see you at the movies.